Magnetic storms rumble through the sun’s photosphere all the time, but they are particularly strong and numerous during sunspot maximums. Sunspots are caused by magnetic connections deep within the photosphere. They occur in pairs and have a north and south pole just like a bar magnet. 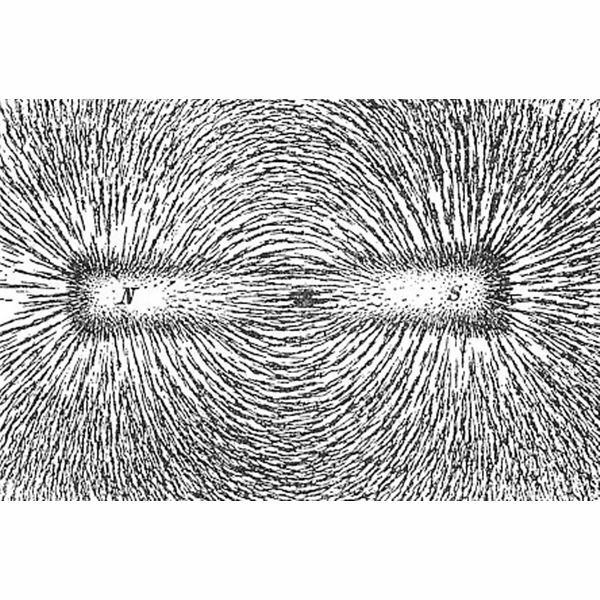 The magnetic lines of force between two connected spots is very similar to the flux lines shown for the bar magnet in the illustration to the left. 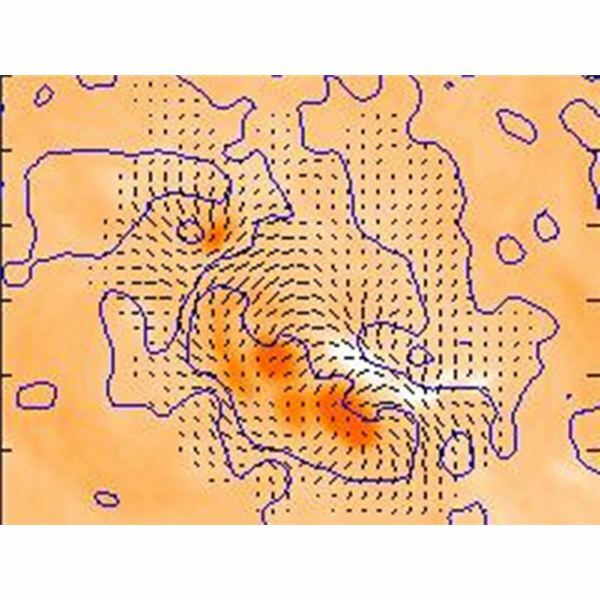 But the photosphere is a boiling cauldron of gas and plasma, and these magnetic connections can be easily disrupted. When they are, many violent things can happen. 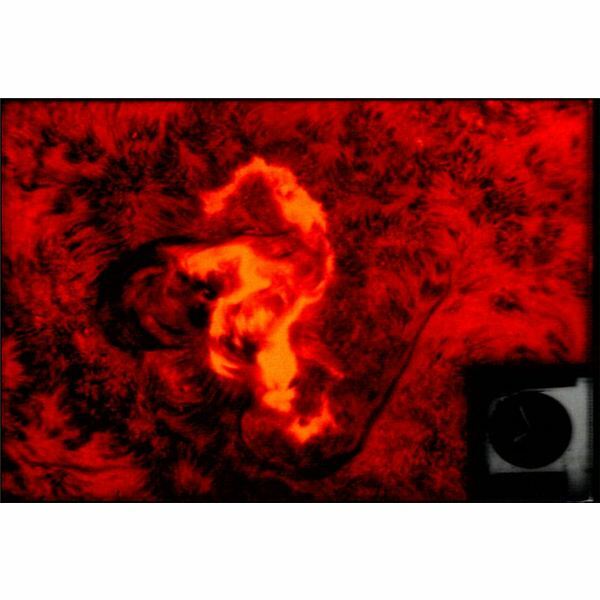 One is a prominence which is a looping ejection of plasma between a pair of sunspots. 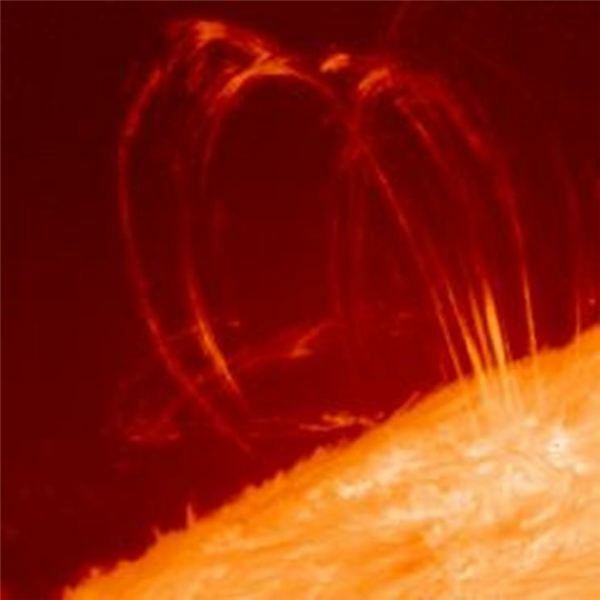 A prominence remains connected to the sun. 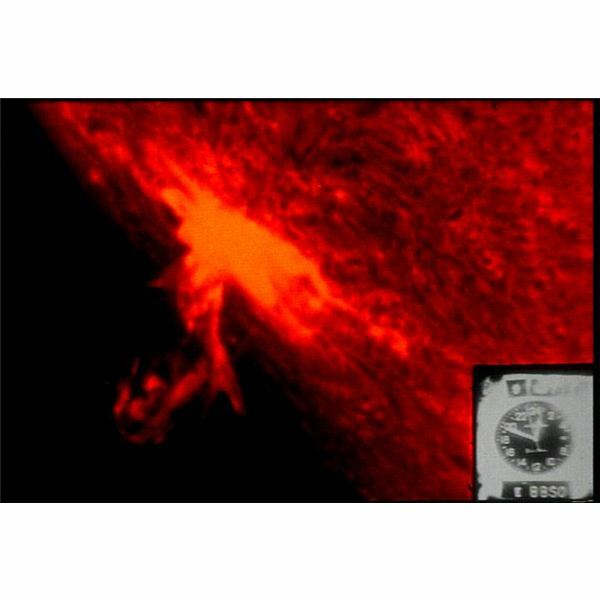 Another more violent disruption occurs when there is a severe magnetic disturbance in the layer below the photosphere—the chromosphere. When these disruptions propagate up through the photosphere they explode into the sun’s outer atmosphere—the corona—and literally blow millions of tons of plasma into outer space. If this plasma hits Earth, it too causes major disruptions. The solar flare cycle starts with these magnetic storms. The magnetic disruption that produces solar flares occurs in the photosphere. As the lines of force shift and move about due to the ferocious activity of the plasma, they sometimes can become twisted. If they twist enough, they can shear. Then flux lines can cross and reconnect with an explosive release of energy. The result is a solar flare. The diagram below illustrates flux lines that have sheared. The flare is the bright area along a neutral line. Solar flares produce x-rays, gamma rays, protons, electrons and plasma. All this is blasted into space in just a few minutes. The electromagnetic products, travelling at the speed of light, can arrive at Earth in eight minutes. Often, after a flare, post flare loops will occur where the flare erupted. Flares can be like gremlins to us Earth-dwellers. The highly-energetic protons and electrons expand the ionosphere, thus disrupting long distance radio signals. Our LEO satellites can have their orbits changed because of the expansion of the atmosphere and the resulting drag. Among these are the ISS. During sunspot maximums, when flares are most prevalent, the ISS loses 400 meters of altitude per day. During spot minimums it loses only 80 meters a day (the Shuttle boosts it back to altitude on each visit). But that’s not the worst flares can do to our satellites. The high energy particles can disrupt or even destroy their sensitive circuitry. Many satellites have had their performance severely degraded by flares. Flares can even shut down power grids. 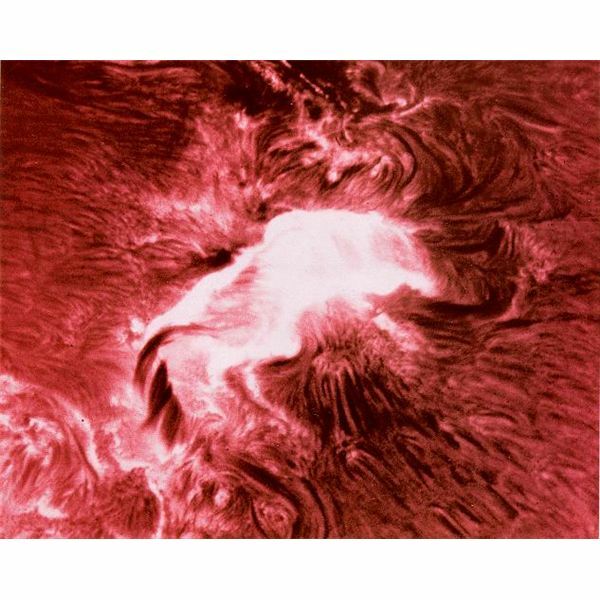 On Aug. 14, 2003, a large solar flare erupted. Shortly thereafter a large part of southern New Jersey was blacked out due to a blown transformer. The transformer blew because of currents generated in it by the flare. Flares even affect airline routes. United Airlines, which flies many routes over the poles, reroutes flights during solar flares because aa flare can give passengers and crew the equivalent of a chest x-ray dose of radiation. They pose a particular danger to astronauts. Had astronauts been on their way to the moon during the ’03 flare, they would have received a potentially fatal radiation dose. The solar flare cycle generally follows the sunspot cycle, hitting a maximum every 11 years. But major flares have occurred during spot minimums. While our Sun gives us life, it also can create havoc on our blue planet. 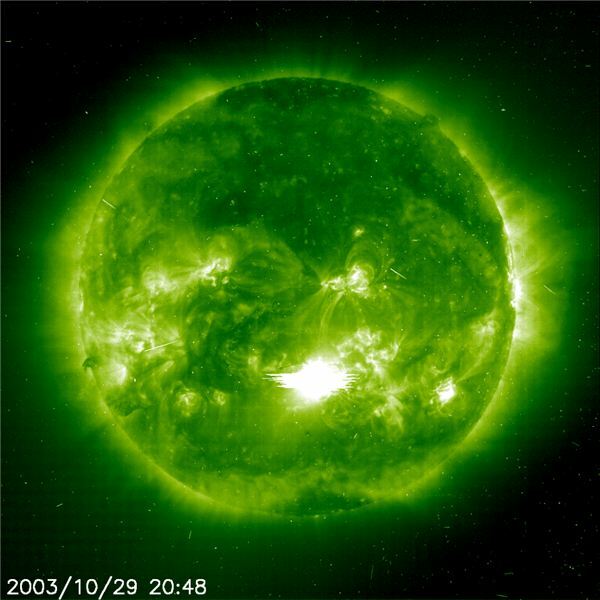 Damage by solar storms and flares can be costly and dangerous. They affect many aspects of our lives.